I was interested to see a page on the website about my old school, which I attended from 1957 to 1962. Various names jumping off the page brought back memories, and so I thought I would share a page from my Report Book. 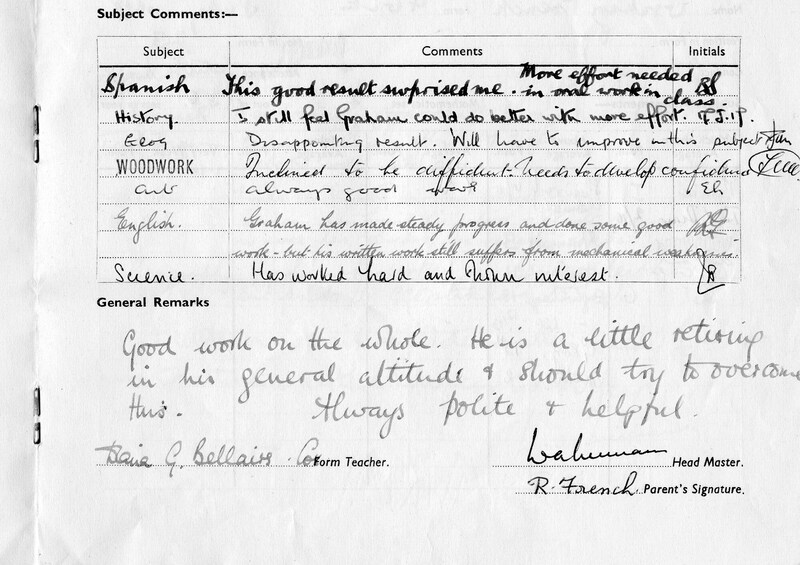 This is from 1960, and was signed by the form teacher Diane G. Bellairs-Cox, the music teacher. As you will see, I was not very good at History and R.I. but everything else seems reasonable bearing in mind there were thirty nine in the form. The book’s cover was written very neatly by my first form teacher at the school, Miss J. Lebinska, who I believe was Polish, and probably the first foreign person I had ever met. Were you at Stanmer Secondary School around this time. What sort of reports did you get? Can you share your memories of this time? If you can help, please leave a comment below. Hi Graham I too have these reports but have only been on line a few weeks so when I work out how to get them on to this page I will. Do you remember the underground playground and the goings on? Ha ha. Those reports look so familier to mine, although I went to Nevill Secondary School. The style of reporting was the same, even though different schools! I wish I’d kept mine! I went to Stanmer from 1959 t0 1963. I also still have my report book, its not so good as yours, I didn’t do so good as you tho, but still enjoyed it there. I remember the underground playground we used to hang around there when it was really wet. Miss Whitney was our form teacher, Miss Scutt took us for music, Miss Agate and Miss Harvey for p.e. Does anyone else remember me? Sue Jenner nee Chapman. I went to Stanmer from 1956-1960. I too still have my report book. My form teachers were Mr Gough -Mr Davies-Miss Bellairs Cox and Miss Witney. I remember the girls had woodwork classes ( I made a teapot stand) and gardening. Anyone remember Digger Davis? P.E. was always my favourite lesson with Miss Moore although I quite enjoyed domestic science with Miss Bowley. I believe Miss Dobson was the other cookery teacher. I was born in Ringmer Road and lived there until 1960.They were very happy times. Graham. I remember you were in Fleming House. Also remember walking down Lucraft Road with you. I was in the winning cross country team (Hepworth) 1960? Remember the Fletcher brothers? I did well in Miss Whitneys class. Also remember Digger Davies and Miss Lebinska who gave me 400 lines for talking when I wasn’t. 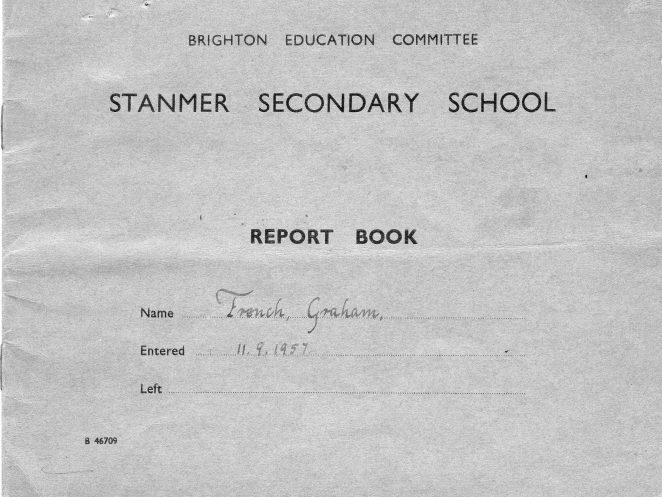 I attended Stanmer secondary school from 1956-1959. The only teachers I remember were Mr Toogood who taught Spanish and Mrs McLaughlin the head mistress. I remember the ghastly communal showers after PE and the lovely times we had playing hockey on the sports field. I also remember that they sometimes brought in sticky currant buns on a wooden tray at morning recess that cost a penny each. So long ago! Would like to add my reports but as I am new to this I don’t know how to.Anyone out there who can help me. Would be much appreciated.Thanks. Editor’s note: A video on adding material to the site can be seen here. Hi, I remember going to Stanmer school, but had to leave as we moved to Portsmouth. We moved in 1961 in the November and had to start at another school for about four months when I left school at the age of 15. It wasn’t a good time to move and start at a new school. I remember the horrible showers and the sticky penny buns, but can’t remember the names of the teachers. I can only remember a couple of names of girls in my class; Pearl Perry was a good laugh I remember she use to go to ice Skating classes. and Janet who use to bring cakes in as her Dad was a baker not sure what her surname was though. My maiden name was Sutton, if any one remembers me it would be good to hear from you. Does anyone know if Diana Geraldine Bellairs-Cox is still alive? It would be great to know. Thank you. Can anyone tell me if Yvonne Bowles is still alive? Would love to catch up if possible. Does anybody remember Wendy Fitzgerald? 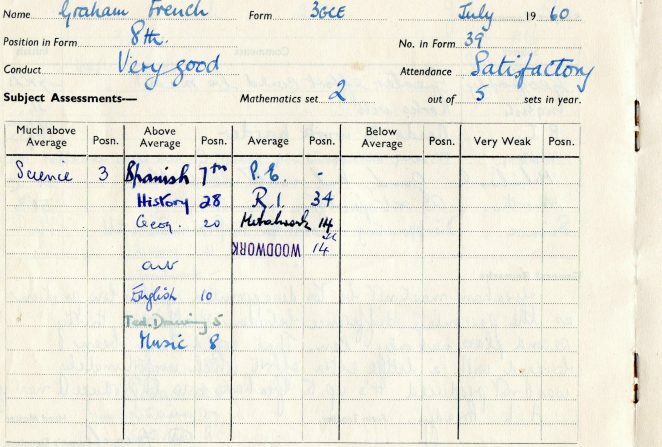 Went to Stanmer School in 1954, hated every minute of it. Was a very shy kid with no confidence. Hated the communial showers as I was also well developed!! And hated Spanish, also we had to wear a silly beret with a tassel on it. Didn’t stay there long as we moved to Burgess Hill, was much happier in that school, no one’s fault just mine. Ah, the dreaded communal showers! I went to Varndean and hated them. Although I think they were optional by the time I started there in 1967. I think we have to remember that, whilst school was a positive and fondly remembered experience for many, for others it was a time of anguish. Hi, I remember the name Wendy Fitzgerald, I had a classmate, Micheal, who I believe is your brother. I believe Diane G. Bellairs-Cox may have gone on to be head mistress at Glenmoor School for Girls Bournemouth where I finished it 1982. I remember her forte was Piano but she did not have an active teaching role.